Do you want to enjoy some great movies or TV shows purchased and downloaded from iTunes Store on an Android tablet or a Kindle Fire tablet or other mobile devices rather than an iPad? The DRM protection implemented on the videos may ruin your mood because you can only watch them on iOS device with your associated Apple ID. The solution is to get DRM removal software to remove DRM protection and convert to MP4 video format. Here, we will introduce top 5 iTunes video DRM removal software for you and you will know why we recommend TuneMobie M4V Converter Plus for you. iTunes Store provides plenty of movies, TV shows and music videos, and you can purchase your favorite ones and download to your PC or enjoy on iPhone, iPad, iPod Touch or Apple TV. Some TV shows are available for free and some movies are available for rental with less cost. However, all of them come with DRM protection associated with your Apple ID, and you can not play on an Android mobile phone or tablet, or a Kindle Fire tablet or other Non-Apple devices. To solve such a problem, many DRM removal software programs have been developed and released. To remove DRM protection from iTunes videos, there are mainly two ways which are decryption and recording. Decryption is definitely the better way. Decryption can remove DRM protection fast and convert to MP4 video without quality loss, while recording is time-consuming and you can only get low quality video. 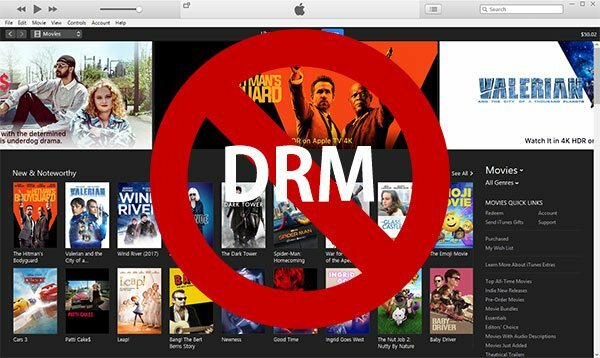 In this article, we will introduce 5 DRM removal software, all of them claim that it's the best iTunes M4V converter but we will show you our test result. 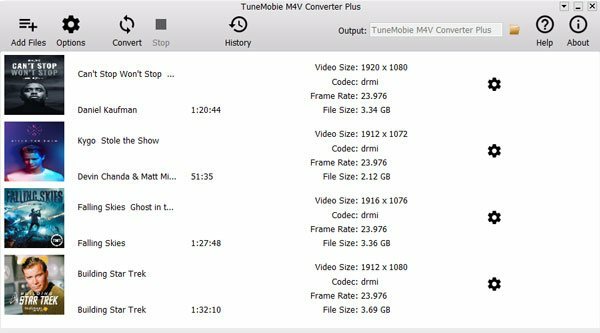 TuneMobie M4V Converter Plus is a dedicated iTunes video DRM removal tool as it's designed only for converting iTunes M4V videos and there is no other additional features. TuneMobie M4V Converter Plus can easily decrypt DRM protection and convert iTunes M4V to MP4 with 100% video quality, all subtitles and audio tracks retained. You can check the main features of TuneMobie M4V Converter Plus below. Fully compatible with Windows 10, iTunes 12.7.4 and macOS Sierra. Extremely fast conversion speed, lossless output video quality, easy-to-use interface and affordable price make TuneMobie M4V Converter Plus the best DRM removal software for iTunes movies and TV shows. 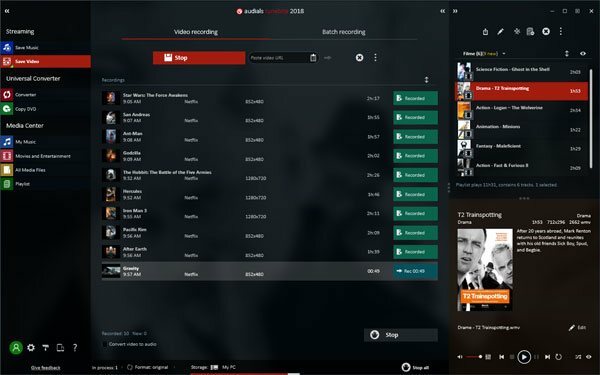 Audials TuneBite 2018 Platinum is only available for Windows, costs $39.90 for new users and costs upgrade fee from 2017 for existed users. The cost performance is very low because you need to pay for version upgrade annually. You can check the main features of Audials Tunebite 2018 Platinum below. Record Neflix, Hulu, iTunes video, YouTube and other online/offline videos and save as MP4, WMV, AVI, etc. Convert all kinds of audio formats to MP3, WAV, M4A, etc. Convert all kinds of video formats to MP4, WMV, AVI, 3GP, MKV, FLV, etc. By using Audials Tunebite 2018 Platinum, you can record video and audio from difference sources including iTunes Store. However, you have to endure with lower video quality, lack of audio tracks and subtitle tracks, long-time operation and annual upgrade fee. We recommend you use this product only for recording Neflix and Hulu videos when recording is the only way to convert. For Apple Music, We recommend you use Apple Music Converter which can convert Apple Music tracks to MP3/M4A directly, and for Spotify, we recommmend you use Spotify Music Converter which can download Spotify songs, albums and playlists and convert to MP3/M4A. Pavtube ChewTune combines audio/video conversion function and DRM removal function. You can use it as a normal media converter to convert all kinds of audio and video formats. But when trying to convert a DRM protected iTunes M4V video, it will pop up a dialog and tell you that you need to downgrade iTunes to 10.5 in order to remove DRM. If you are using an old machine with iTunes 10.5, ChewTube may be a good choice. But if you are running iTunes 12, you will only get a 1KB MP4 video. That is to say, DRM removal function in ChewTune is almost unusable. There is a Mac version of ChewTune, which only works on Mac 10.7 or below. You can get ChewTune Windows or Mac at $29. You can check the main features of Pavtube ChewTune below. Convert MP4, MOV, MKV, M2TS, MTS, TP, MPG, FLV, WMV, etc. to normal video formats like MP4, WMV, AVI, etc. Convert MP3, M4A, WMA, WAV, FLAC, OGG, AIFF to normal audio formats like MP3, M4A, WAV, etc. Working as video converter, Pavtube ChewTune doesn't provide video editing features. Besides there are many free and powerful video converters like Freemake Video Converter and Any Video Converter Free which perform better. Working as DRM removal software, Pavtune ChewTune is almost unusable. You should never purchase it for converting iTunes videos. SoundTaxi Pro + VideoRip can convert normal video formats and audio formats, remove DRM protection by recording, copy output files to iPod and burn audio tracks to CD. When adding an iTunes M4V video to SoundTaxi, it can detect that it's a DRM protected video, then pop up a dialog and ask you to open the specific website to download and install DRM removal plugin. However, the website for DRM removal plugin is not accessible any more. That is to say, as iTunes DRM removal software, it's not working any more. SoundTaxi Pro + VideoRip is only available for Windows and it costs $39.99. You can check the main features of SoundTaxi Pro + VideoRip below. SoundTaxi Pro + VideoRip is totally unusable as DRM removal software. As media converter, it can only convert limited types of formats. As to the iPod copy feature, iTunes or some other dedicated iPod transfer software would be better. As to CD burning, there are also many free alternatives. The program is totally nonsense. Aimersoft DRM Media Converter works as normal video/audio converter as well as DRM Media Converter, it claims it can help you legally bypass digital copyright protection from M4V, WMV and ASF video downloaded or purchased from iTunes, Windows Media Centre, Zune Marketplace, BBC iPlayer, Xbox Live Store, Amazon Instant Video, Limewire, uTorrent, FrostWire and more. It will install a virtual sound card for audio recording. Add an iTunes M4V video to this program and start conversion, the program will popup a dialog, instruct you to play the video in separate window in iTunes. The screenshot in the instruction is outdated and doesn't match to iTunes 12 menu, and it doesn't work even if you play in separated Window. Aimersoft DRM Media Converter is only available for Windows and it costs $35.95. You can check the main features of Aimersoft DRM Media Converter below. Record DRM protected audio files and audiobooks, save as MP3, M4A, etc. Convert all kinds of video formats like MP4, MKV, AVI, WMV, M2TS, FLV, MPG, MOV, RMVB, etc. Convert all kinds of audio formats like MP3, M4A, WAV, AIFF, OGG, WMA, APE, FLAC, etc. Provide optimized profiles for different devices like iPhone, iPad, LG, Samsung, Kindle Fire, PSP, etc. As normal video converter, Aimersoft DRM Media Converter performs not bad. However, it doesn't matach to what its name indicates. If you are using iTunes 12, you will end up with "iTunes player error" and you can never convert a iTunes video. If you are still looking for a program to convert DRM protected M4V videos to all-purpose MP4, you should seriously give TuneMobie M4V Converter Plus a shot.